I also noted that the armor on the saint's back recalls the dragon's wings. Victor and victim are one and the same, subject and object united. And this was long before I knew the saying every painter paints himself. 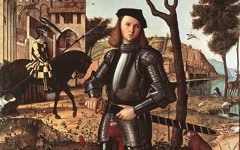 Carpaccio, St. George and the Dragon (1502) Tempera on canvas. Scuola di San Giorgio, Venice. Months later I happened on an engraving (below) of Baccio Bandinelli's studio. Dated 1550, it depicts apprentices learning how to draw in the great man's studio with - what else? - skulls, bones and fragments of torsos on the floor. Compare it to the ground on which the legendary combat takes place (top) and you'll see some similarity. I didn't need the engraving to convince me though because the day I was there I couldn't help but stare at the dragon's blood. It just looked wrong. And then it dawned. The dragon raises and displays his paws like the hands of an artist (left). The dragon's blood isn't blood but paint. Carpaccio spilt it on the corner of the monster's mouth and it dripped down the canvas, five centuries before Jackson Pollock and Morris Louis were hailed for making a similar "break-through"!1 Nor did I then know that dragon's blood is a red resin obtained from the Dracaena tree and was widely used in Renaissance studios to decorate gilding. It may have been an inside joke but it's not frivolous. 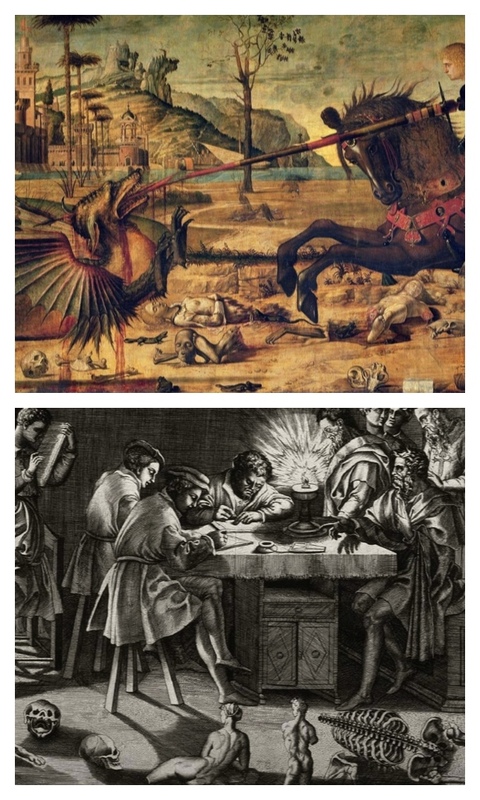 St. George and his dragon are not external symbols of good and evil but of order and chaos in the artist's mind. Imagination (the dragon) is chaotic, freely merging fragmentary forms in wild combinations. He chews and spits them out, just as we chew over problems too. The artist's rational mind (St. George) must then impose order and logic on the chaos of his imagination to create a masterpiece and that is what we see. He is executing his painting.2 Note how the horse's mane above his head (top) recalls the rays of the sun (or at least illustrations of rays) while the hook emerging from the dragon's head is moon-shaped (below). The sun symbolizes order, daylight and exterior perception; the moon, night, imagination and insight. Not surprisingly, then, the etymological origin of dragon derives from the Greek word drakein meaning to see clearly. Even the struggle on horseback would have reminded artists not only of how weapons are symbols for a paintbrush but of how all art is the product of a creative struggle inside the artist's mind. A 19th century cartoonist even depicted Ingres and Delacroix (below) battling it out with pen and paintbrush in a very similar scene. A mounted warrior, as I have explained before, is a little-known but very common self-reference in art because the word for easel in all Romance languages (cavaletto, chevalet etc.) 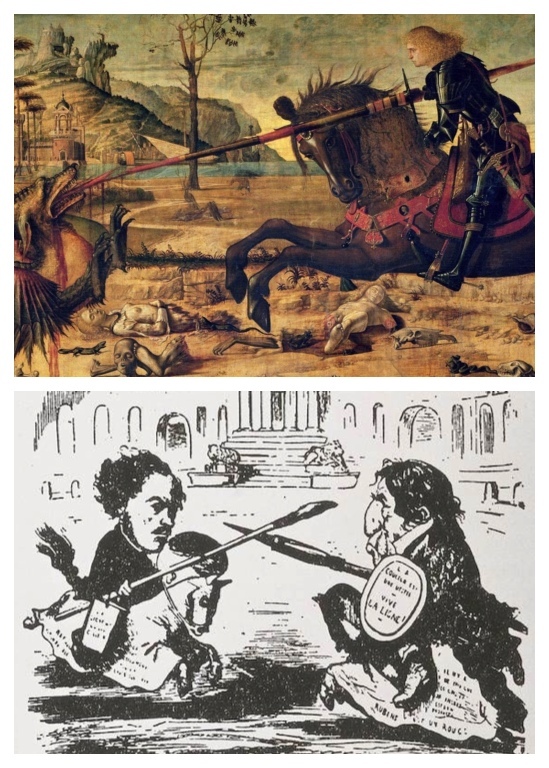 derives from horse and many tools of the artist, including brushes, pens and pencils, resemble a lance or sword.3 The palette, too, becomes a natural shield (see Delacroix's, below). 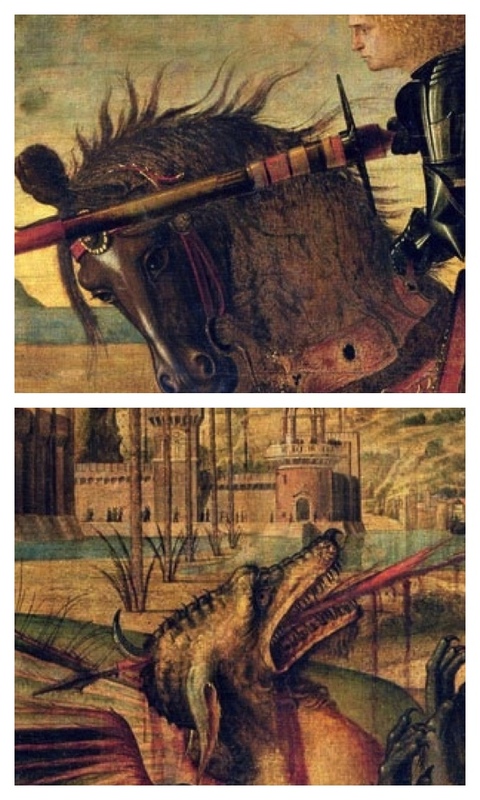 Painted in 1502 the true meaning of Carpaccio's St. George and the Dragon was certainly not part of his commission and he, no doubt, fooled his patrons. It is nevertheless entirely within the esoteric tradition of art that stretches through every masterpiece up to the present day. I cannot, of course, ever prove that statement definitively but I do hope that after showing the same intent - indeed, the same methods - in more than 500 works of art made between the 13th and 21st century that it is not an idle claim. Besides, literature, and even successful Hollywood films use the same themes too.4 It would all be in keeping with comments by artists from Dürer to Delacroix and beyond that few people ever understand art because few can see it.5 I feel privileged to be one of the few. I hope you do too. 1. Jackson Pollock was the first artist in the 20th century to drip paint onto a horizontal canvas in rhythmic ways while Louis Morris later poured paint straight down an angled canvas. 2. Contemporary accounts of the legend state that St. George tamed the dragon, surely a metaphor for how Reason tames the mind. 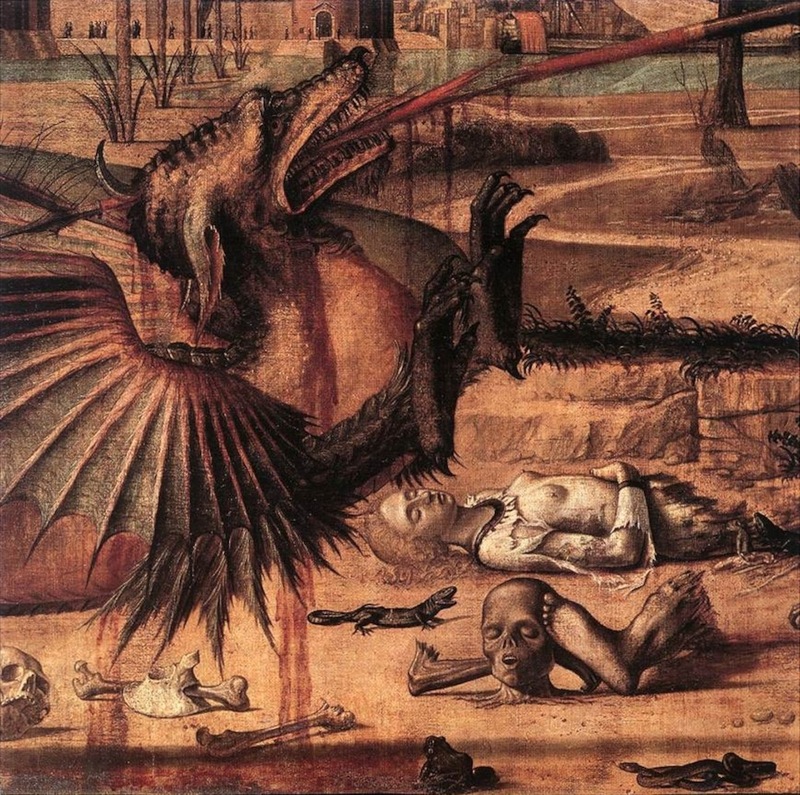 In art, though, the dragon is so often skewered or dead that artists seem to be referring to a mythic link between death and the completion of art. 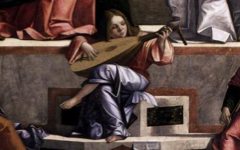 This ancient symbolism is probably why we say an artist executes a painting in the first place. 3. For artists in armour see Rembrandt's Man in Armour and Minerva (c.1655); for an easel as horse, see Manet's The Horsewoman (1875); for the symbols of an artist's tools, see Brush and Palette. 4. See my blog entries, "Ratatouille and the Great Masters." (27th April, 2011), "Oscar and Art 2012" (1st March, 2012), "Hollywood and the Man within my Head" (31st January, 2012). Original Publication Date on EPPH: 19 Oct 2013. © Simon Abrahams. Articles on this site are the copyright of Simon Abrahams. To use copyrighted material in print or other media for purposes beyond 'fair use', you must obtain permission from the copyright owner. Websites may link to this page without permission (please do) but may not reproduce the material on their own site without crediting Simon Abrahams and EPPH.